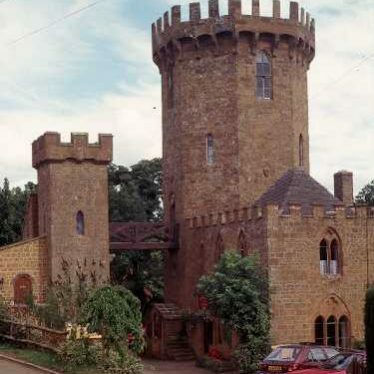 1 Folly, now house. c1790, with later alterations and additions. Limestone ashlar front with squared coursed limestone rubble to sides and rear. Hipped slate roof. Renewed stone lateral stack. 2 storeys. 2 octagons placed side by side. Entrance to right with hipped porch on slender supports. Sashes with stone lintels and stone sills to each floor. Flat bands to first and second floors. Limestone single-storey extension with gabled stone slated roof to left. Early 19th century ashlar extension to century. The smaller ‘lodge’, contains a doorcase with segmental head and side lights with key blocks and modern casements. The main building has sash windows. 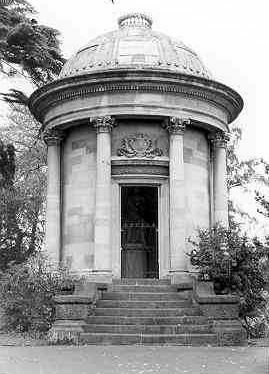 The Folly owes its existence to a Mr Thomas Webb, land surveyor 1774/5. The model is of an upright knife box of the period. The high pitched roof of blue slate dates from 1891, its construction involved the destruction of the upper (5th) storey of the building. 2 Located E of the church, beyond the A-road. A curious three-storeyed Georgian house of grey stone, consisting of two octagons placed side by side so that the S front is simply a pair of canted bays. In one of the octagons the drawing room, in the other a room and the staircase. To the N a brown-stone addition, also Georgian. Ridge and furrow cultivation, Halford Parish, dating from the Medieval period onwards. In some areas of the parish the ridge and furrow survives as an earthwork. In other areas it is visible on aerial photographs. Find of a Roman coin 300m northwest of Halford Hill Farm. Halford Mill, the remains of a watermill for which there is documentary evidence from the Medieval to the Imperial period. 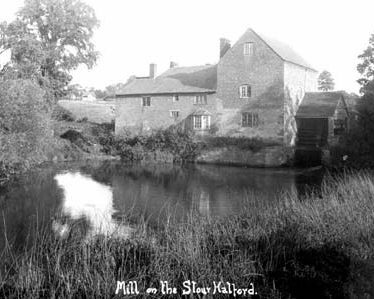 The present building is of stone, and the mill house adjoins it at the west end of Mill Lane, Halford.